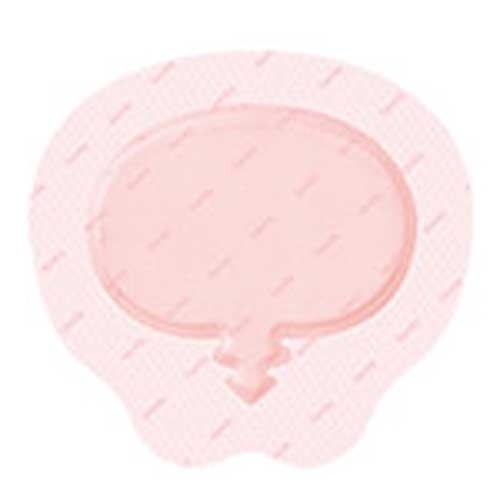 Allevyn Gentle Sacrum Border Dressing is a 8-1/2" x 9" dressing with a soft silicone gel adhesive. Designed for people with particularly sensitive or fragile skin, the silicone gel adhesive minimizes trauma to the wound at dressing change and helps avoid patient pain without compromising care. ALLEVYN triple-action technology maintains the optimal fluid balance to maintain a moist wound environment. Conformable dressing – providing comfort for the patient. Minimizes trauma to the wound and pain to the patient during dressing change. Available in a range of shapes and sizes – squares, rectangles and a range of shapes for dressing awkward areas. Like all ALLEVYN Dressings, ALLEVYN Gentle Border has at its heart a unique triple layer technology that effectively manages exudate, helping to ensure that the wound is kept at optimum moisture levels to support moist wound healing. The dressing consists of a highly absorbent hydrocellular foam pad held between a perforated wound contact layer which is coated with a soft silicone gel adhesive and a highly permeable outer top film. ALLEVYN Gentle Border Dressings achieve the benefits of easy application and removal,1,3,6 and the ability to reposition through an adhesive technology based on a soft silicone gel. On application, the silicone gel adhesive on ALLEVYN Gentle Border Dressings flows into the crevices of the skin, allowing more points of contact to stay in place. On removal, the silicone gel adhesive stretches and flows out of the crevices of the skin, minimizing the risk of trauma to the wound and pain to the patient.